This digest arrives quarterly to inform you about all the Ecwid changes. 67% of respondents to our recent blog readership survey (thanks for participating, guys!) use social media to promote their stores, making it the most popular marketing activity for small businesses. Sell across devices with a new, mobile-friendly shop section on your FB business page. Run automated dynamic ads and many other FB ad formats. Retarget your store visitors on FB and optimize ads for conversions with the Facebook pixel integration. Exporting your Ecwid product catalog to Facebook will take one click (literally). You can do it in Control Panel → Sell on Facebook. 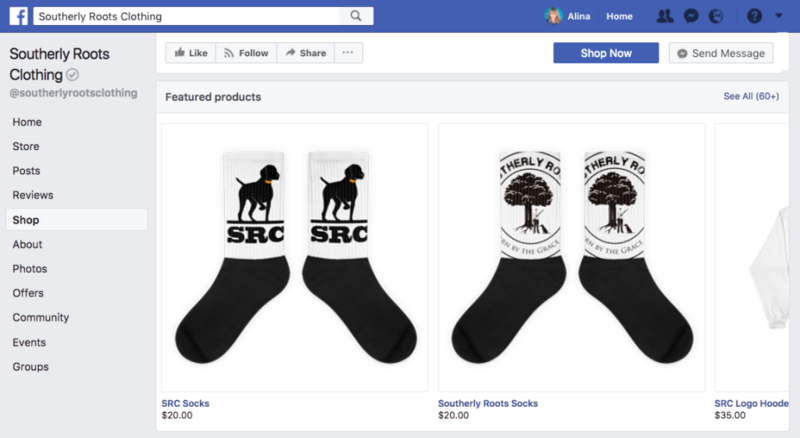 As soon as you export your products to Facebook, you can use your Facebook Product Catalog to run dynamic ads. If you want to retarget your store visitors, install the Facebook Pixel by simply copy-pasting the Pixel ID into your control panel. If you already sell on Facebook with our old Facebook Store app and want to switch to the new, mobile-friendly store that is integrated into many FB ad formats, enable the new integration in Control Panel → Settings → What’s New. The new Sell on Facebook integration is available on all paid Ecwid plans. Selling on Amazon is similar to renting a boutique in a large, popular mall — at a lower cost. Amazon.com alone counts 300 million users. What makes this marketplace such a giant? Well, its polished interface, global reach, reliability, and great features like two-day shipping or rich customer reviews, to name a few reasons. Selling products from your Ecwid store on Amazon is like having a celeb cousin. You get your piece of the fame pie by simply hanging out with them. Your Amazon products receive traffic, even if your brand name is not a buzzword. As long as you sell good products for reasonable prices, Amazon’s hungry audience will discover them. Ecwid’s new integration with Amazon is powered by Codisto.LINQ, a company that professionally connects e-commerce platforms with marketplaces. It not only allows you to export your products to Amazon, but also to stay synced. Protection from overselling: as soon as someone buys your product on Amazon, your Ecwid inventory is updated (and vice versa). No manual work: your product catalog is automatically synced with Amazon, releasing you from spending hours on uploading your products. Competitive deals on Amazon: set different prices for products on your Amazon listing to compete with other Amazon sellers. Easily discovered products: customize your product titles and descriptions with keywords that work best on Amazon to help customers find your deals. Start selling on Amazon in your Control Panel → All Sales Channels → Amazon. (Available on the Business plan and higher. See the Codisto.LINQ pricing). eBay is one of the busiest marketplaces out there. It has very few barriers to entry, making it very easy to start selling. Popular among geeks and DIYers, eBay is a perfect home for handcrafted, unique, or rare products. Our new eBay integration is also powered by a professional service, Codisto.LINQ. It allows selling on eBay directly from your Ecwid control panel. Keep your inventory synced and customize your products to make them more appealing to eBay shoppers: change prices, titles, descriptions, shipping and return policies, etc. Start selling on eBay in Control Panel → All Sales Channels → eBay. Hint: If you have lower volume sales or just want to test new products, there’s a free Amazon & eBay integration in Ecwid. Trimpo is an app in the Ecwid App Market that supports listing on those marketplaces (currently in a free beta version). The Ecwid App Market is available on all paid Ecwid plans. Ecwid’s integration with PayPal has now been updated to the latest version — all without extra actions on your side. 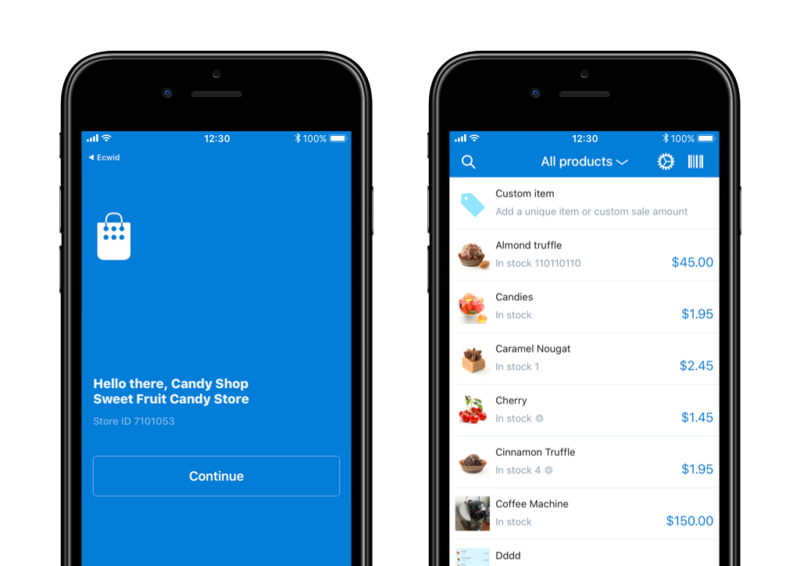 This update brings in a new, convenient shopping experience to your customers. Checkout within your website. The enhanced In-Context Checkout gives your customers a simplified checkout experience that keeps them local to your online store. Before, your customers were redirected to a full-screen page to authorize their payment with PayPal. Now, it happens in a small mobile-friendly pop-up window. It means less distraction for your customers and more completed purchases for you. Faster checkout flow. Streamlining your checkout process is an essential part of conversion optimization. One Touch™ Checkout allows your customers to log into their PayPal accounts automatically, skipping the login process and entering their billing info. It’s still the same secure PayPal services, so you don’t have to worry about your customer data. Connect your PayPal account to Ecwid in Control Panel → Payment. It’s simple: you will need nothing more than your email address. Marketplaces. In Control Panel → All Sales Channels → Marketplaces, you’ll find a single page that organizes all the marketplaces that are integrated with Ecwid. Here you can enable your feeds and set up your listings. Starter Site. Under Control Panel → All Sales Channels → Starter Site, you’ll see a new, compact, and informative page devoted to setting up your free one-page e-commerce website. Last year, we added the ability to give your employees, freelancers, or outsourcers administrative access to your store. They can log in to your control panel using their emails and help you to edit your product catalog, update inventory, tweak the design, chat with customers, etc. Your staff can’t access your billing info and invite or delete other team members. 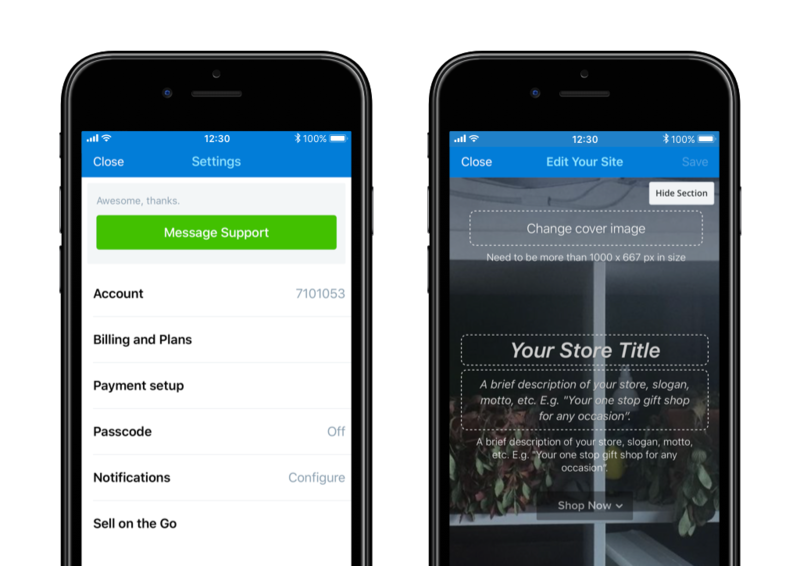 Now your team can manage your store on the go using Ecwid Mobile. For example, your team members can sell your products on a street market, and you can stay in-house to run the business. Learn how to let your staff manage your store via Ecwid Mobile: on iOS, on Android. Mobile commerce is a hot e-commerce trend in 2018. So, we’ve retouched our mobile store management app for iOS (and are rolling out these updates to the Android version very soon). The apps functionality is expanding to make it an independent store management tool, so that you don’t need to stay next to your computer and could sell anywhere you want. Create and edit an e-commerce website from your smartphone. You don’t have to use your сomputer to create a selling website! Download the app, create an Ecwid account (if you haven’t got one yet), and go to Settings → Account → Edit Starter Site to open the editor. Start building a one-page e-commerce website from anywhere with internet access. Edit your website (change contact details, business hours, cover image, and texts) whenever you want. Faster login for Ecwid Mobile and Sell on the Go. Using the Ecwid Mobile Control panel and Sell on the Go apps together has become easier: now you don’t have to log in to each app separately. It’s enough to log in to one of them to be logged in to the other automatically. If you sell in person (a brick-and-mortar store, pop-up store, craft show, art fair, etc. ), the Sell on the Go application (for iOS only) will allow you to accept credit cards via PayPal Here or Square POS. You can also accept cash via Sell on the Go. Open your Ecwid Mobile app, go to Settings → Download Sell on the Go. In your iPhone, go to Settings → Phone → Call Blocking & Identification. Switch on providing Caller ID for Ecwid. Go to your Ecwid Mobile → Settings → Force Data Synchronization. That will add customer names and phone numbers to your address book. When a customer calls you, you’ll see their name. RapidWeaver is a desktop site builder app for Mac. It’s perfect for building classic-structured websites. It has 50+ themes plus the support of third-party add-ons, including our new e-commerce plugin that adds an online store to a RapidWeaver website in seconds. No need to call for developers — you won’t have to interact with code while using the plugin. The following video tutorial explains how to get started. Ecwid works more smoothly with more popular WordPress themes (Customizr, Abubize Business, Evolve Plus, Themify themes). Change the look of your website as often as you want — your Ecwid store will work just fine! Better snippets of your store links (added page title, description, and image) that you share on social media. Rich product previews promise more clicks to your store. SEO improvements, including compatibility with Yoast premium SEO plugin. 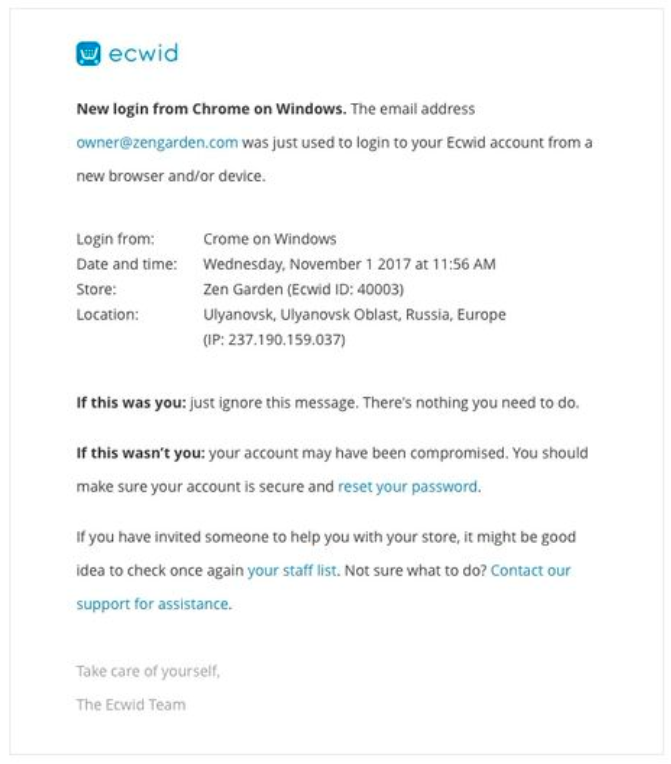 If you (or someone else) tries to log in to your store from an unusual location (or a new browser), we’ll warn you by email. This way, you’ll be able to reset your store password quickly (by clicking the link in the email) if you can’t recognize who has entered your control panel. It can give you additional protection from phishing attacks or other malicious attempts to steal your store data. Mercado Pago: accept credit cards, cash, wallets in Argentina, Brazil, Chile, Colombia, Mexico, Venezuela, Peru, and Uruguay. Get all the payments into your Market account and transfer them to your bank account. PayU Latam: 20+ payment options for Colombia, Argentina, Brazil, Chile, Mexico, Panama, and Peru. Lightning-fast setup: connect your bank account without leaving your Ecwid Control panel. Frictionless synchronization with your Ecwid product catalog. Partial or full refunds right from your control panel: the faster your refunds, the happier your customers. Stephanie Corn is using Ecwid Payments in her Ecwid store. Read here how Ecwid Payments contributed to 8X growth of her business. Mollie payments: accept iDeal, credit cards, PayPal, BitCoin, and more with a single setup. Paytrail: e-payments to all Finnish banks, major credit, and debit card payments. Datatrans payments (beta): credit and debit cards, SEPA, PayPal, E-banking, PaySafeCard, Skrill, and other payment methods for Switzerland. EU Cookie Banner: add a banner on your store giving consent compliance of the European Cookies Law. Sales Booster: create up-sell and cross-sell offers that are displayed after your customer adds a product to their cart. Receipt Print: allow customers to print their receipts from their store account. Acutrack Fulfillment: automate the order fulfillment process. GiftUp! : sell & redeem gift cards on your website with no monthly fee. Social Login: let customers sign in to your store with their social account. Free Shipping Bar: inform customers about your free shipping deals and motivate them to reach the threshold. ShippingEasy: integrate your store with USPS, UPS, and FedEx, manage your shipments, print shipping labels. Required Login: add a requirement for customers to sign in before they access any page in your storefront. We have added coupon and discount values to order items and abandoned carts. Now you get the type and amount of a discount or a discount coupon amount applied to a specific item. Know how much tax total was applied to a shipping charge, only if the tax is applied to both subtotal and shipping. This is done through the taxOnShipping field to orders, abandoned carts and calculation of order details endpoints in Ecwid REST API. Now it’s possible to create custom logic when a certain payment or shipping is enabled or show the list of set up payments and shipping methods in an external system. You could also use it to display payment methods icons for a certain payment option when it’s enabled at checkout. A new webhook event which fires when store information gets updated. For example, now you can get notified when a merchant updates their email or company address and you won’t have to check it manually. Get the default storefront price of a product which includes taxes, options, or variations with the defaultDisplayedPrice field from /products endpoint of the Ecwid REST API. Now it’s easier to show the price from a merchant’s storefront in a custom storefront solution or in custom widgets for products. We build new features with you in mind — and we want to hear from you! Should you have a question about these updates, or want to share an idea, we’ll be waiting for you in the comments section below. More big news is coming soon — stay in touch.